Description - Afraid to get turf because you don't want your lawn looking like it was treated with nuclear waste? Well, be afraid no more with our Tacoma Turf Rolls in your lawn. These fake grass rolls are one of the most realistic looking artificial grass' on the market today, and are certain to make anyone who walks or drives by your lawn do a double take. Maintenance of our Tacoma Turf Rolls is next to nothing and is by far cheaper than having natural grass in your yard. Great as landscape turf, these artificial grass rolls are also great as playground turf, pet-friendly turf, and much more. A 15-year warranty backs our Tacoma Turf Rolls. Face Weight – 75 oz. Weight – .570 Lbs. per square feet. Recommended Uses – Our Tacoma Turf Rolls are commonly used as landscape turf, but these indoor/outdoor turf rolls are also great as turf for playgrounds, in doggy daycares, and much more. 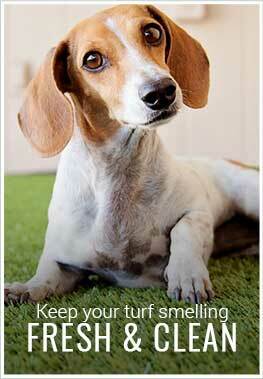 Landscape turf great for pet areas, playgrounds, and more. These turf rolls have a very realistic look and doesn't seem to crush down when stepped on. I think it was a good choice.